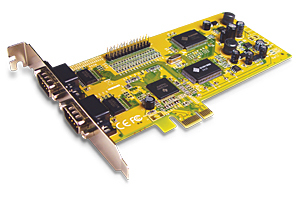 4479A PCI Express Multi-I/O communication board provides independent high speed RS-232 serial and IEEE 1284 interface, is compatible with PCI Express x1, x2, x4, x8 and x16 lane Bus, allowing the board to be installed in virtually any PC system that is equipped with PCI Express slot. The new slot standard supports Windows 2000 and above, plus Linux 2.4x and above kernel. PCI Express card series is the advanced and high efficient solution, ideally for commercial and industrial automation applicatins.